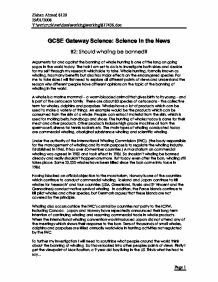 B2: Should whaling be banned? Arguments for and against the banning of whale hunting is one of the long on going sagas in the world today. The task I am set to do is to investigate both sides and decide for my self through my research which side to take. Whale hunting, formally known as whaling, has many benefits but also has major effects on the endangered species. For me to take sides I will first need to explore all different points of views and understand the reason why different people have different opinions on the topic of the banning of whaling in the world. A whale is a marine mammal – a warm-blooded animal that gives birth to its young - and is part of the cetacean family. There are about 80 species of cetaceans – the collective term for whales, dolphins and porpoises. Whales have a lot of products which can be used to make a variety of things. An example would be the products which can be consumed from the skin of a whale. People can extract material from the skin, which is used for making belts, handbags and shoes. The hunting of whales today is done for their meat and other products. Other products include high grade machine oil from the spermaceti, sinews for tennis rackets etc. The main types of whaling conducted today are commercial whaling, aboriginal subsistence whaling and scientific whaling. Under the authority of the International Whaling Commission (IWC), (the body responsible for the management of whaling and its main purpose is to regulate the whaling industry. Established in 1946, it has over 60 member countries.) A moratorium on commercial whaling was agreed in 1982 and took effect in 1986. So shouldn’t whaling be banned already and really shouldn’t happen anymore. But today even after the ban, whaling still takes place. Some 25,000 whales have been killed since the ban came into force in 1986. Having blocked an official objection to the moratorium, Norway is one of the countries which continue to conduct commercial whaling. Iceland and Japan continue to kill whales for ‘research’ and four countries (USA, Greenland, Russia and St Vincent and the Grenadines) conduct native survival whaling. In addition, the Faroe Islands continue to kill pilot whales and other species, but Denmark argues that these islands are not covered by the principle. Whaling also occurs outside the IWC’s control by countries not party to the ICRW, including Canada. Japan and Norway have repeatedly announced their long-term intention of continuing whaling and resuming commercial trade in whale products. When the international whaling convention was introduced Japan did not attend any of the meetings which shows their response to the ban. Tens of thousands of small whales, dolphins and porpoises are killed annually worldwide in hunting activities not regulated by the IWC. As far as I can see there is a mixed reaction to the question, however there is a noticeable pattern in the information I have collected. Majority of people believe that whale hunting should be banned. I also believe that whaling should be banned. The reasons behind my choice of sides’ lies clearly on the fact that whales are an endangered species. If “we” do not take care of them and stop hunting them down then there will be no more whales left in the world. The table below shows the estimated number of whales left in the world today. These numbers are just an estimation and may not be accurate so there could easily be less in the world today. I believe that whaling should be banned not just to the countries who want to follow but the whole world. I strongly believe that if one country was not follow then they should face consequences. 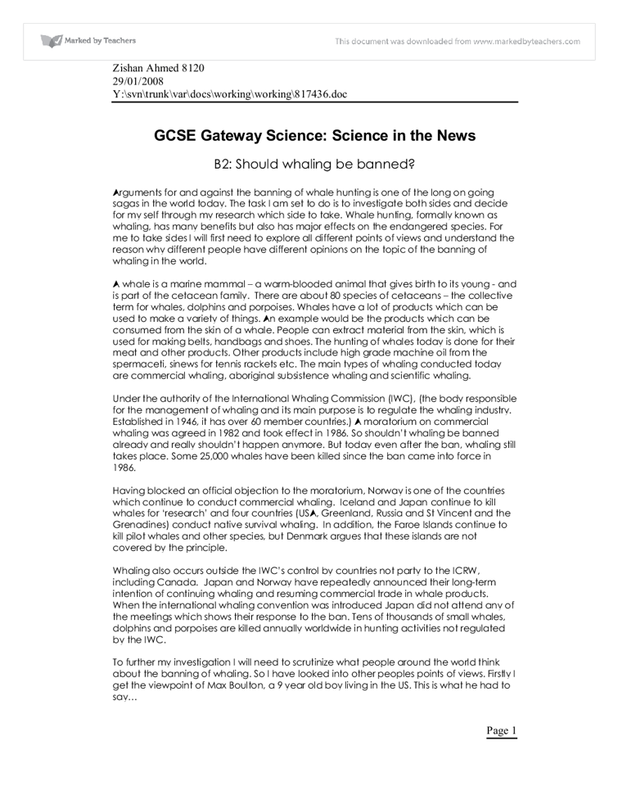 Animal behaviour and research into attitudes on animal testing. Should whale hunting be banned? I believe that this question received this response because dogs benefit the workforce greatly and they are respected whilst they proceed in saving lives. The one person who said that they weren't sure was most likely because there was a possibility that the dogs can get injured whilst undertaking the jobs in the workforce. People also say that whaling cannot be controlled, however this is not true as Norway have implemented a scheme in which inspectors search every whaling vessel. Also in some cases inspectors have been replaced with "black boxes" which registers GPS location, engine effort, steering commands, harpoon cannon shots and the weight of each whaled hauled on board. 9) Allow ten seconds for the rod to cool, as placing it straight in the Petri dish would result in killing all the bacteria on contact. 10) Use the glass rod to stir the bacteria throughout the Petri dish so they are evenly spread throughout. matter how colourful the display of the male is, the female will just ignore him. Some animals demonstrate their skills. For example, some birds catch fish in order to impress females. The female will naturally be impressed because in order to survive you need food, and a male that can hunt will allow the couple and their offspring to survive.